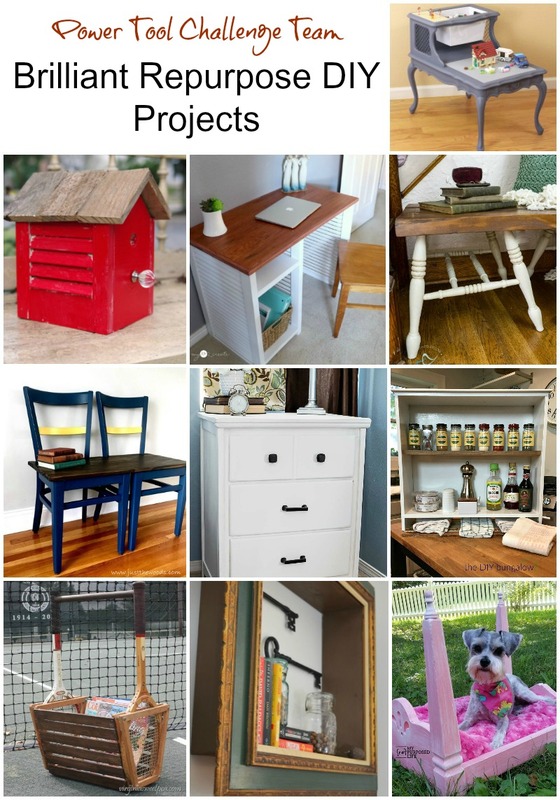 I’m so excited about this project, not only because my kids love it, but also because it is part of this month’s power tool challenge. The theme is REPURPOSE this month. My entry is this end table repurposed into a LEGO play center. The plastic bin which houses the legos pops out for easy clean up and the little drawer in the table is the perfect place to store building instructions. Everything in arm’s reach for the best experience! So how did my project come together? Well, it started with this 10$ thrift store find. And turned into this all in one play center. The lower level features a large 15x15 LEGO plate building area. While the user level has a smaller play area, perfect for holding mini figures or precious builds, along with a large pull out bin for loose legos. The drawer is the perfect place to keep all the instruction booklet. Highly functional, self contained and compact. My kind of end table! To transform it, I first removed the faux leather inserts. Next I sanded the entire thing down. I used my Finish Max Ultra to paint this piece. IT was so fast and easy on all the curves. When the paint was dry I used E6000 to glue the plates down. Just add LEGOs and you won’t be able to pull your kids away!